Denmark, the first ever nation to win the Miss Earth crown, is represented this year at the pageant by a Faroese beauty. Turid Elinborgardottir, Miss Earth Denmark 2015, grew up on a farm in an archipelago where perhaps the world’s most stunning and dramatic natural vistas can be found. No wonder she loves and cares so much about the environment. Here, Turid sat down with Missosology-Scandinavia and shares her life, her dreams and her aspirations. 1) Tell us about the Faroe Islands, what is your daily life like? My daily life includes working on “the farm”, as people from outside of the Faroe Islands might call it. I was born and raised in the capital of the Faroe Islands, Torshavn, but I now live on a smaller island known as Skopun. The daily routine is getting my hands dirty; I deal with chickens, goats, sheep, cows, and tending to them on a daily basis. As the Faroe Islands are so remote, we try to use all of our natural resources for our daily lives. The Faroe Islands are unique compared to Denmark, Norway, or Sweden, in the sense that we have a Faroese currency that is backed by the Danish currency. We also have a unique language, but we are taught English and Danish from a young age. Most Faroese people speak English better than they do Danish, and the Faroese language itself is the closest to “old Norse” other than any other language. We still uphold a lot of the ancient traditions that our ancestors did. 2) A lot of people criticize and target the Faroe Islands because of “the grind”, they are, in fact, known as “sea shepherds” – can you tell us about what the grind is? What is your stance on it? a.) Again, it is not commercialized or for profit. b.) All of the whale meat is used amongst the community, including feeding the elderly and the poor; it is distributed based on need. c.) The Faroe Islands are an incredibly remote country, and the cost and resources of importing would be dramatically raised if we were to not participate in the annual grind. This would make our carbon foot print (which is the smallest in the world), dramatically increase, as well as our self-sustainability dramatically decrease. d.) Many other nations farm and raise animals simply to be slaughtered under horrific and inhumane conditions. The whales live a beautiful, full life, and do not feel any pain what so ever when they are hurt. We also do not use slaughter houses, or fishing nets, or anything like that when we gather the whales, they are mercifully killed in the sea, and the shore washes away the blood. e.) There is a certain quota that the Faroe Islands are held accountable for. We do not come near the quota, nor have we ever, at anytime. We are very respectful and law-abiding citizens, and we have even tried to debate with the Sea Shepherds, despite the fact they are not a recognized organization in the Faroe Islands. 3) Very impressive! You seem to know your facts regarding this issue, but what are some other ways you feel that you are a true “earth warrior” compared to other countries? Speaking generally, Scandinavians are not materialistic. We tend to be incredibly minimalistic, actually. The tax rates on daily life are the highest in the world, so we are forced into quality over quantity. We do not have excessive articles of clothing, make-up, car use, and we do not indulge in some of the luxuries that other countries that have more resources do. In Copenhagen alone, bicycle transportation is more common than cars, and Denmark has made a plan to double the size of organic farmland over the next ten years. I live the daily life of planting and harvesting vegetables, and tending to livestock… It is ironic that I should be so fortunate to win the Miss Earth Denmark title of all of the other young women, considering how close to mother earth I am in my daily life. 4) So competing in a beauty pageant is not necessarily something you would do, or see you doing? What made you decide to enter the Danish national final? 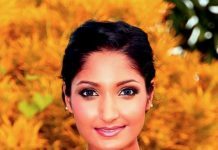 The new Miss Universe Denmark “Face of Denmark” organization wants to showcase representation from all over Denmark; this includes constituent countries, which are Greenland and Faroe Islands. Prior to the official “applications” being opened, girls from the Faroe Islands were encouraged to enter at large, by Laila av Reyni, a famous Faroese couture designer and friend of mine, who was coincidentally judging. (There are only 50,000 people in the Faroe Islands, so if you aren’t friends with someone or related to them, someone else you are friends with is!) She was working closely with the new organization to try to cultivate a pageant in the Faroe Islands, so I entered as a semi-joke (I really am a simple farm girl!!!) and I was eventually appointed the first “Miss Universe Faroe Islands” – I was SO nervous to do this pageant, I never felt I had a chance… I am really not a model, or a personality… But I have always had a desire to travel the world and meet new people, and learn new languages, and while I am a “normal” girl, I am also a glamour girl.. So of course the opportunity to be competing was huge. 5) What were some of the major obstacles you found when competing? I would like to believe that the only obstacle competing was myself; everything else was out of my control… I watched a lot of videos, and learned what exactly a “pageant” was, and what it meant to be an example for other people, and that it was more than just beauty, glamour and bikinis… I would, if I should have won, be required to speak publically about issues that I was passionate about. Anti bullying, breast cancer, ovarian cancer, refugees, war, and more. 6) So what do you think about the current refugee crisis in Europe? It is hard for me to believe that such inhumane and devastating atrocities can occur in the world, and it is painful for me to see this happening everyday on the news. When I was in the USA, I went to New York and saw the Freedom Towers, it was incredibly moving for me to be in the place where this happened, and it gave me a more realistic perspective on what happens in the world, outside of Denmark. I would say that we are marginalizing a global issue by calling it a “refugee crisis” in Europe; I would say the whole world has a crisis regarding positive examples of how people should act towards each other. I would like to believe that every interaction I make, every word I speak, and every smile I give can help brighten someone else’s day, and start a wave of power that can help others understand each other. I think ignorance is a major issue when it comes to this “crisis”. I feel very badly for all of the individuals who have been displaced due to war and terrorism, but I have to believe in my heart, and have hope, that there is going to be a brighter future with education and understanding. I grieve for the victims of terrorism and their families and I hope in my lifetime I can be part of a positive impact to create a better world for my children and their children! 7) So you went to New York and the USA to prepare for Miss Earth, tell us about that? My first visit in the USA was to the Worldwide Nature Fund (WWF) in Washington D.C. Fortunately my directors did their best to help find me sponsors and endorsements, including the Miss Earth Denmark partner, Odessa, which is an upscale caviar and champagne bar soon to open up in Washington D.C.! I was able to discuss some of the ways we eat organic salmon, trout, and many other things, and even had input on the menu. I felt so honored and like a royal queen. I had to learn to try to stand out more, and rise to the occasion. 8.) Many people have called you the “Viking Queen” or the “Queen of the Faroese”, but they have not referred to your other sister queens, or even in neighboring nations with that title, why do you feel that is? I imagine it has to do with the nature of the spelling of my name, which is very Viking in nature, especially because my last name is after my mother’s first name, “Elinborgar” and “dottir” means daughter, which is a Viking/Norse tradition. 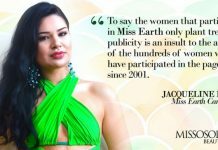 9) I am sure you have been asked this before, and will be asked this again, but why should you win Miss Earth? I would like to make pageants more mainstream in the Faroe Islands, and in Denmark, that standing out, being successful, and having confidence is not something people should shame you for. There is a lot of self-censorship of success in Denmark, and I think that it inhibits us from our ultimate potential. I am not ashamed to be a success, and I want to win this competition, and I want people from a country that only has 50,000 people to know that if I can do this, so can they. Pageants can be for anyone, and I know that Danish and Faroese girls deserve better, I hope I can help open the door for that! 10) Okay, so you talk about a cultural shift, but when it comes to Miss Universe, Miss Earth, Miss International and Miss World – Scandinavia has only won twice (Mona Grudt in 1990 at Miss Universe, from Norway, and Catharina Svensson, 2001 for Miss Earth) – do you really think that pageants are for the modern day Scandinavian woman? I believe that if we can understand the maximum potential of competing abroad, and understand the long-term impacts we can make, then yes. I believe pageants as a whole are making a comeback, at least in Denmark. 11) Out of all of the contestants, who are you the biggest fan of? I would have to say Philippines! I love the Filipino culture and the hospitality of the people. I am a fan of anyone who has had the courage and dedication to go through what I have gone through to get to this point. 12) Last question! Where do you see yourself in 15 years? I see myself continuing to be an Earth Warrior! ! I would love to have a successful, organic, cruelty free cosmetic line that is based in the Faroe Islands, and maybe a TV personality, or on the evening news. 12) Any words for your fans? I am obsessed with my fans! You guys are so amazing, and I even hate saying the word “fans” because you have all become extensions of my family. I am so, so, so honored by the overwhelming support fro the Faroe Islands, so many people I do not know have reached out and lent me their support… To my beautiful nation of the Faroe Islands, I love all of you so much, and you warm my heart.